We all have those books that we keep going back to whenever we have a question about our current projects. I thought I would share my favorite "go to" books for period clothing research. 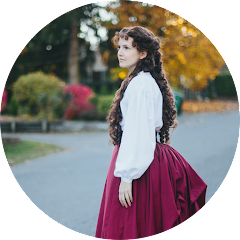 Even though I have yet to sew a non movie historical outfit, I do know a bit about period clothing. I just haven't gotten around to making anything yet. 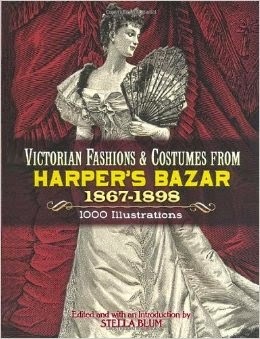 My first book I go to for Victorian clothing is Victorian Fashion and Costume from Harper's Bazaar. This book is filled with great illustrations of fashions from 1867-98. The pictures have dates with them and usually a small, sometimes large, description of the piece. It covers everything from day wear to evening wear, from hairstyles to shoes. And you wanna know the best part? It's only $3.99 on Amazon! My next favorite is Victorian Fashions Volume I 1880-1890. I was lucky to find this book at Half Price Books a few years ago for under $10, but I didn't know it at the time. This book is also filled with illustrations from the Late Victorian era. It covers young girls, young ladies, and women's fashion between 1880-90. Next is Period Costume for the Stage and Screen. 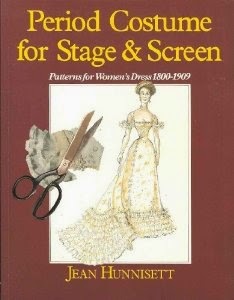 This book is filled with patterns from 1800-1909. Just a warning, the patterns do not have any seam allowance. You have to add that yourself. And the instructions aren't exactly the best either. I don't recommend this book for beginners unless your using it for reference only. Nineteenth Century Fashion in Detail. 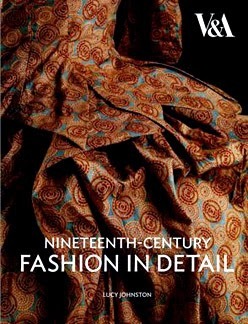 This book has beautiful pictures of men and women's clothing through the 19th century. The only thing I don't like about this book is that there's usually only 1 image per outfit. There are line drawings, but it would be nice to be able to see the whole dress rather than just the one close up. But the dresses in this book are so beautiful! I definitely recommend at least checking this book out from the library!